IPMI stands for Intelligent Platform Management Interface standardized computer interface for administrators to manage computer system and monitor its operation. If you see error at last command check system log – it is possible that your hardware does not support IPMI. Recently I had to create a bash script to copy some files based on date. But How to determine what was the yesterdays date? The answer was in date man page. The root password is the key to any Unix/Linux system and the person who knows it is with full rights. But there is a simple way to crack root password. In FreeBSD by default you do not have bash as shell prompt. type chsh -s /usr/local/bin/bash root to change the shell for root or replace root with username you want to change the shell. Recently I got into problem to assign 2 IPs on one physical NIC. There was nothing mentioned in official documentation so I did some research and find the solution. It is really simple if you are not afraid from command line and VI editor. Unfortunately I did not find a GUI. Be sure that you are root. Otherwise type su – to become. Then type ls to see the contents – you should have file ifcfg-eth0 if you have just one interface otherwise if you have multiple interfaces there you’ll find other files like ifcfg-eth1…n. Next step is to edit newly created file and put the IP we needed. If needed repeat steps 5 and 6 with different numbers after”:” (1,2,…) to add additional addresses. If you issue ifconfig you will not see newly created interface, because it is no activated – you need to restart network /etc/init.d/network restart will do it for you. I needed to check multiple addresses for use. I did not find any ready solution so I wrote a script. echo "host $1.$i is up"
Sometimes in troubleshooting process is necessary to turn of firewall for a short period of time. 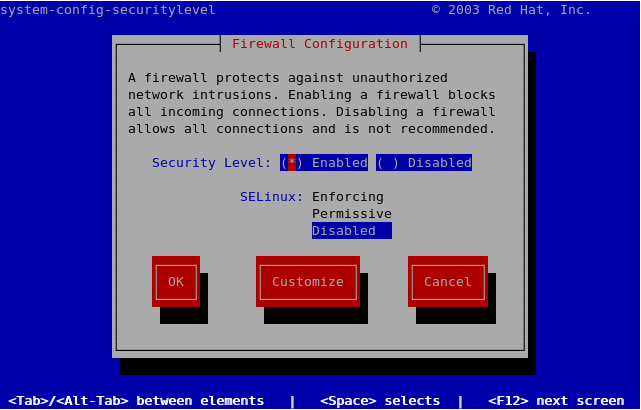 In Linux based OS usually IPtables is used as firewall. It runs as service and could be stopped, started or restarted. In addition the status could be checked. Gives you hints how to use it. Note that to execute any of actions you need administrative privileges – either login as root, “su -” or setup sudo. From GUI you can use the same tool just by removing -tui or go to System–>Administration –> Security level and firewall. Another GUI frienly way is System–>Administration –> Services where you can do the same actions as from terminal. TIP: Do not leave your system unprotected on Internet. Use cheap SOHO firewall in front of the system until IPtables is set up. TIP: If you are newbie in firewall configuration use some third party tools as firestarter to guide you in your setup. NOTE: Above steps are for RHEL (CentOS) compatible systems. 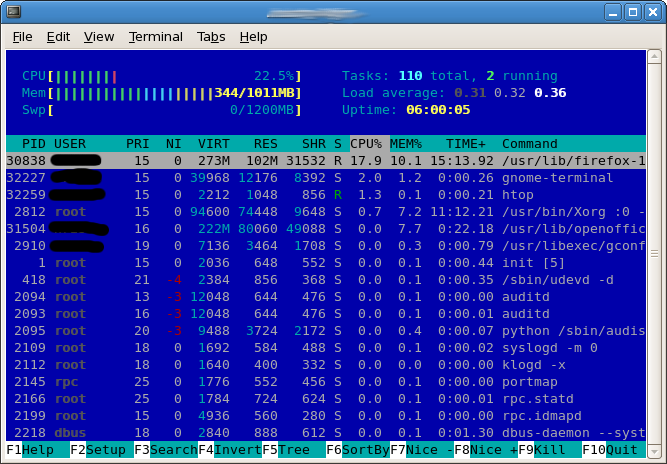 Thanks to Ubuntu tutorials I’ve realized that my lovely tool top has now better replacement htop. Default colors were not very appropriate for white background so I switched easily (F2-Setup->Colors) to mc colors.